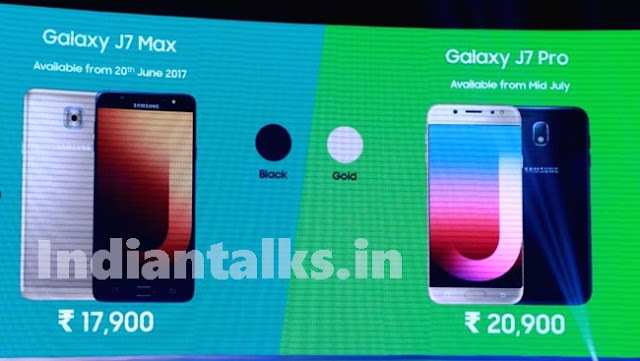 To Expanding its J series, Samsung on Wednesday unveiled Galaxy J7 Max and Galaxy J7 Pro devices are priced at Rs 17,900 and Rs 20,900 respectively for the Indian market. Galaxy J7 Max will be available on June 20 and Galax J7 Pro from mid-July. “The Samsung J series smartphones are most sought-after devices in the mid-segment section in India,” Sumit Walia, Director Mobile Business, Samsung, told reporters here. Encased in a unibody metal design, Samsung Galaxy J7 Pro sports 5.5-inch full HD Super-AMOLED display with 2.5D curved glass design. Samsung Pay Mini payment solution is coming to the new J-series smartphones as well, starting with Galaxy J7 Max. Company’s Pay Mini payments solutions will support payments via UPI and wallets like Paytm. Samsung Galaxy J7 Max and Galaxy J7 Pro support Always-on display and Sport 2.5D curved glass design. The devices also feature social cameras for instant sharing of photos on social networking sites and with an augmented reality experience. “The social camera feature has been designed by Indian engineers under ‘Make in India’ initiative,” Walia said. Samsung Galaxy J7 Pro gets a 5.5-inch full HD Super AMOLED display. It runs Android 7.0 Nougat out-of-the-box. The smartphone is powered by an Octa-core Exynos SoC clocked at 1.6GHz. It comes with 3GB RAM on-board, along with 64GB internal storage, which will be expandable up to 128GB via a microSD card. Further, Galaxy J7 Pro is backed by a 3,600mAh battery, and support microUSB 2.0 port for charging. Connectivity options include Wi-Fi, Bluetooth 4.2, and GPS. Samsung Galaxy J7 Max, on the other hand, features a slightly bigger 5.7-inch display with Full HD (1080p) resolution. Powered by a MediaTek chipset, The Galaxy J7 Max packs 4GB RAM and 32GB internal storage. The battery in Galaxy J7 Max is 3,300mAh.